"These cranberry and cinnamon-flavored, sweet, pink pears are very delicious!" Place cranberry juice, sugar, and cinnamon stick into a large saucepan. Bring to a simmer over medium heat, and simmer until the sugar dissolves. Meanwhile, peel the pears, leaving the stem intact. Place the pears into the simmering juice and cover. Cook until the pears are tender, turning occasionally, 15 to 20 minutes. Once tender, remove the saucepan from the heat, and set aside to cool to room temperature. 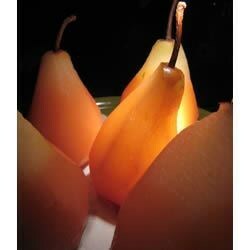 Turn the pears a few times as they cool so the color remains even. Very good! This was used as a dessert. Very tasty. I cooked down the leftover liquid and drizzled it over each pear just before serving. Presentation looked lovely and taste was terrific. Color wasn't as noticable as I would like for it to have been. Would add a drop of red food coloring to liquid. Tried apples...taste good, but reduce cook time by 1/2. Delicious, and made the whole house smell wonderful! Next time I might cook the pears longer to help them soak up even more of the sauce.